Photos from my parent's house, whose property ends where the river begins. If you aren't familiar with their backyard, it's hard to know what to think. I'll just say that from where I stood when I took these shots, you shouldn't be able to see any water. 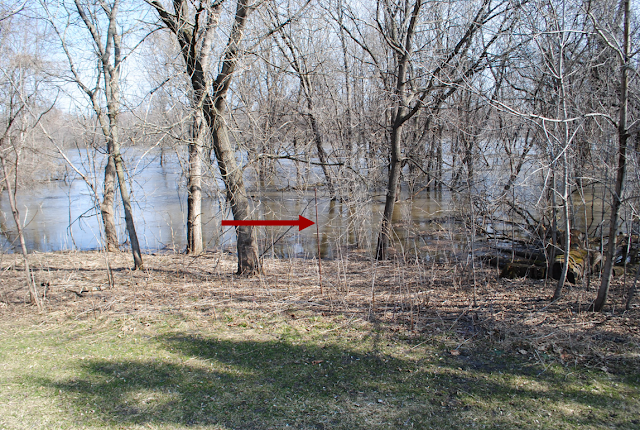 In this next one, the arrow points to the stake in the ground that marks the spot where the water rose to in 1997. If it reaches that stake, my folks will have to turn off the water, plug all the drains, and go stay in town. The photo below shows the creek, which should be about three feet wide and shallow enough to see the bottom, and wade through without getting wet higher than your ankles. And then a few of Aliza and her grandpa looking for fish. They only found weeds, sticks, and debris. But they had fun looking! Whoa! Hopefully they're not expecting anymore rain! I saw it when i was driving on 35W on Saturday...CRAZY! !